Agatha Christie had a truism when it came to stories: a gun shown in the first act must be used by the third act. What she meant was that something as significant as a gun simply cannot be shown in the story if that gun is not going to eventually be used. It’s too confusing for the audience. I found a similar situation here. I mentioned that I purchased a canned mackerel, prior to smoking the whole mackerel. I honestly thought I would never open that can . After all, I had all this delicious smoked mackerel. Then, I made the mistake of overestimating the preservative effects of smoking. 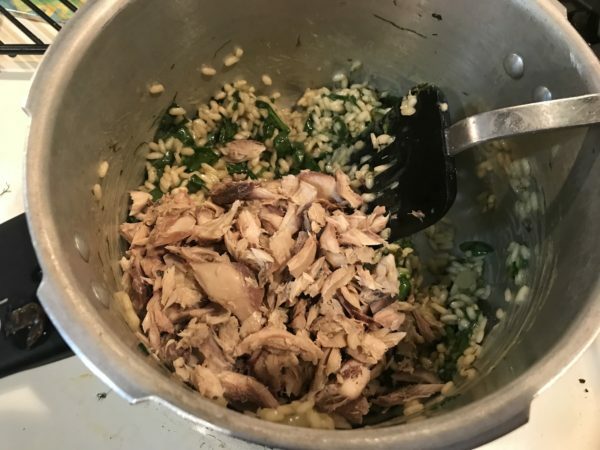 My beautiful mackerel – the amount I planned to use in this risotto – had spoiled. But, I still had that can. And, I’m extremely happy to say, it worked beautifully. Another miscalculation of preservation time led to maybe my favorite part of the dish. I normally would have used onion, but the onion I bought was starting to look…scary. It seems that the holiday season has caused me to lose track of time! At any rate, this led to me using garlic instead. 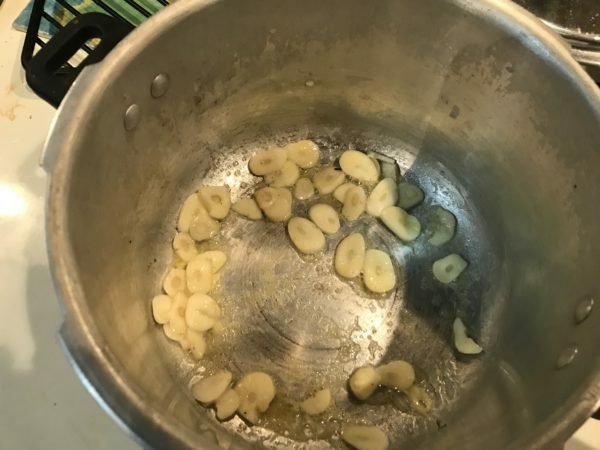 The result is a terrific roasted garlic flavor that pairs well with all the other elements. 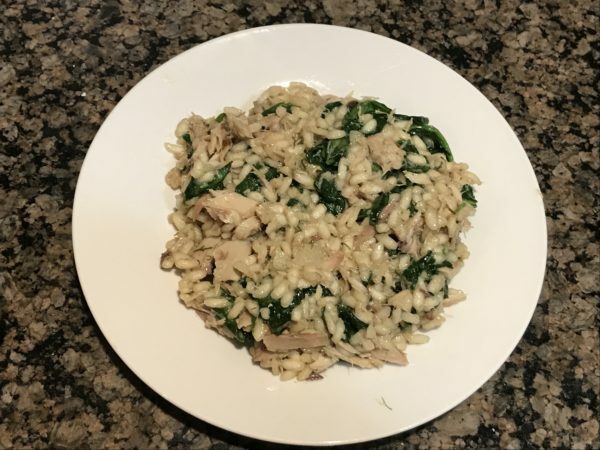 This recipe uses a pressure cooker, which certainly isn’t necessary to make a risotto, but which I found very useful to make the dish quickly. Heat butter in pressure cooker pot on medium with the lid off. Add garlic slices and sauté until slightly browned, about 2 minutes. I probably don't need to tell you, but the smell was AMAZING. When is Axe going to come out with a Roasted Garlic body wash? 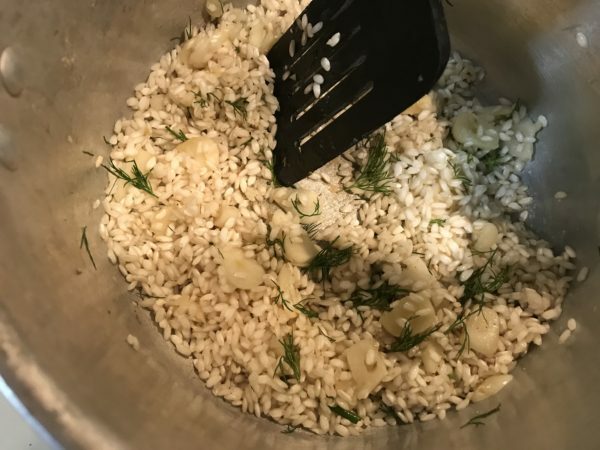 Add rice and dill to the pot, stirring constantly to ensure that the butter fully coats the rice. Scrape frequently to prevent the rice from burning to the bottom of the pot. Cook for about a minute. Add chardonnay to deglaze the pot. Cook, stirring frequently, until the wine is just about fully absorbed. Add stock to the pot and scrape the bottom thoroughly to release any stuck bits of rice. IMPORTANT: The pressure should build up in about a minute, but don't wait until the valve on the pressure cooker starts rocking. 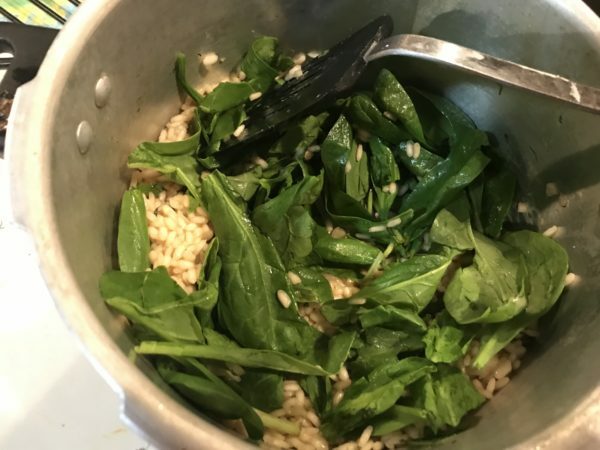 If the rice isn't fully cooked at the end of the cook time, it's perfectly okay to reseal the pressure cooker and cook some more. 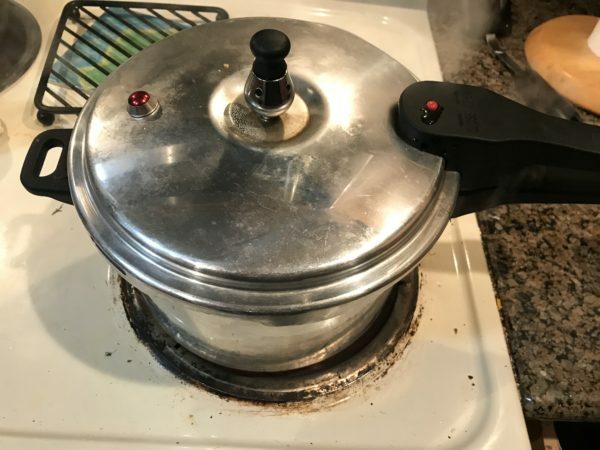 But, depending on the pressure cooker, the valve might not start rocking to release steam for several minutes, which will mean overcooked (possibly burned) rice. Seal the pressure cooker lid and raise the heat to high. Set the timer to 7 minutes. While the rice is cooking, remove the mackerel from the can. Scrape off the skin and discard any bones. If you're picky, use only the white flesh (I liked all of it, so I put the whole thing in). 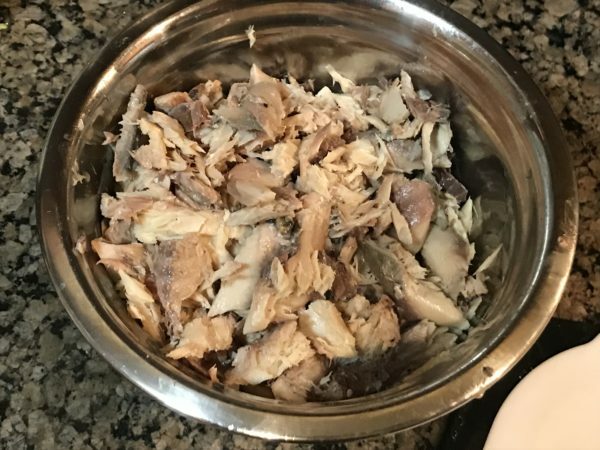 Rub the mackerel between your fingers to detect any pin bones (there won't be many...mackerel is a pretty easy fish to separate from the bones), and set aside the mackerel. IMPORTANT: never spray cold water directly on the pressure relief valve of a pressure cooker as it can create a dangerous hot water spray. As soon as the timer goes off, remove the pressure cooker pot immediately from the heat. Place the pot in the sink, and spray cold water on the lid of the pot, avoiding the pressure relief valve. Gently try to release the lid. If it's still secure, spray some more cold water on the lid and try again. Place pressure cooker pot back on the stove and raise heat to medium. Stir salt into the rice and adjust if needed. 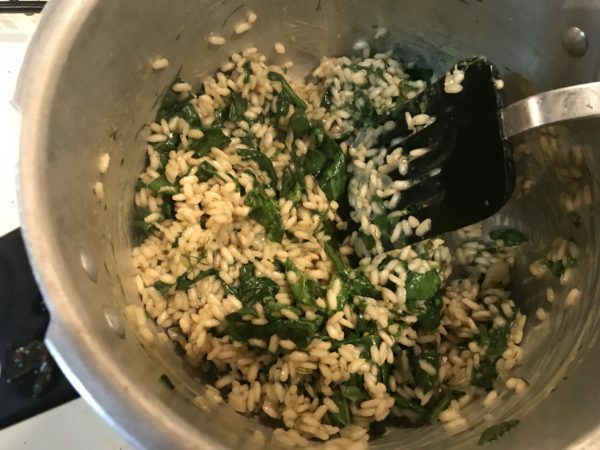 Stir spinach leaves into the rice. Continuing stirring the spinach until it is just wilted. Add mackerel chunks to the pot. Stir thoroughly to ensure an even distribution of spinach and mackerel. Serve immediately. This is served on a roll (4 points), but I could just as easily have done without it. Very tasty!! Note that this same recipe works for other kinds of fish, too. Mix all ingredients together, except for flour, in a bowl. Allow to rest in refrigerator for about 15 minutes. Sprinkle a small amount of flour on a sheet of waxed paper. Form 1/6 of mixture into a patty on the sheet of waxed paper. Sprinkle a small amount of flour on top of the patty. Spray nonstick pan with cooking spray. Raise heat to medium. Cook patties for about five minutes on each side. Note: because I made the ingredients light, the patty will be tricky to flip over without some of it coming apart. 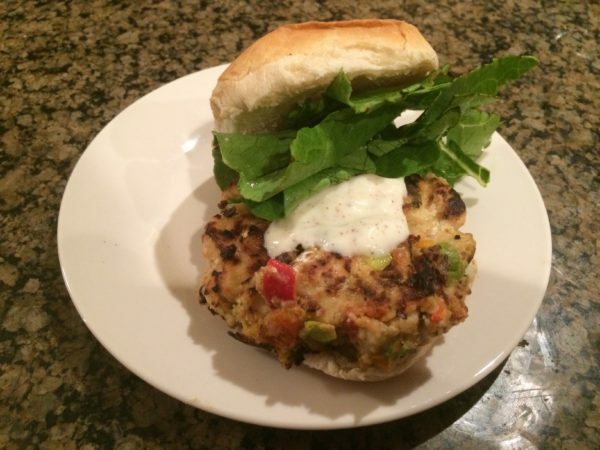 Serve with a sauce made from fat free yogurt, hot sauce, grated garlic, and whatever other seasonings you want to add. I used sumac to provide a citrus flavor, since lemon juice would have curdled the yogurt.